I was a tad confused when I opened the Myrkvidr ‘Blood Eagle’ Beard Balm, was this a balm? When I went to stick my finger into the balm and it hit the surface like the guy in the viral video bombing an icy swimming pool, hitting a solid impenetrable surface. So I sent an email to Nathanael who owns Myrkvidr to check if I had a balm or a wax? I was informed that it was indeed a balm, a strong hold balm! The Blood Eagle was a Viking sacrifice where the rib cage would be opened from behind to resemble eagle wings. I’m guessing that takes the same amount of force as extracting this balm, but I did extract it. I used the end of my metal comb, the same way that I do for Moustache wax but this was firmer. I then thought of warming it by placing it in my palm and rubbing my hands together. This however still left a very solid gum like substance but spread out. I then worked it into, onto my beard and moustache, no wax needed here! The balm as you can imagine left me with a very firmly held beard, the scent is Sage and it smells very nice. I imagined that this would be what the guys use who take part in competitions, styling their beard into wacky shapes. I have to say that ‘Blood Eagle’ balm from Myrkvidr is not for me, it is too firm and wouldn’t work its way to the skin to help moisturise it like other balms. Saying that, once you have worked it into your beard, its kept in place and there isn’t a hell’s chance of any stray hairs. 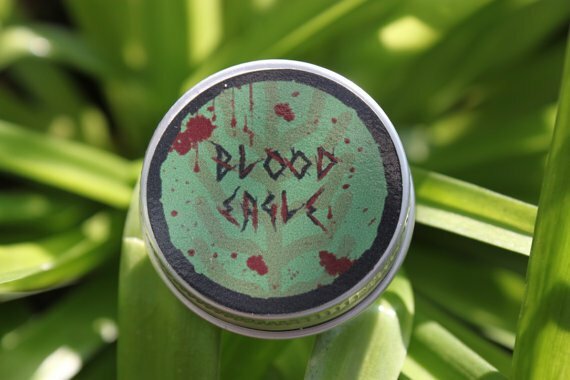 ‘Blood Eagle’ is available from the Myrkvidr Etsy page and is £2.99 for a 15ml tin. Made with high quality organic Shea butter from the Shea nut tree of west Africa. The Shea butter retains all its natural content and goodness. It is very therapeutic and will help heal dry skin. Our beeswax comes from the European honeybees apis mellifera, it is a natural wax that is made from the cell walls of the honeycomb. Beeswax will help hydrate your beard.